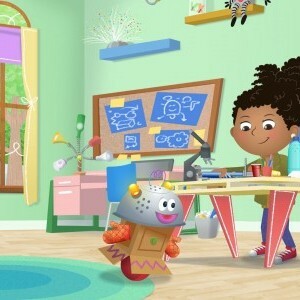 ADDISON (20x11) is an animated kids’ series chronicling the comical yet brain-teasing adventures of Addison, a young girl who loves to solve mysteries when she’s not busy building quirky inventions. Combining a playful, comedy-oriented narrative style with the perennial appeal of mysteries, ADDISON subtly imparts not only STEM and STEAM (science, technology, engineering, arts and mathematics) curriculum and creative problem-solving skills, but also emotional intelligence. The value of behaviours such as co-operation and stick-to-itiveness is always evident as Addison and her friends persevere through setbacks until they find the solutions they seek. In each episode, Addison and her friends use imagination, reasoning and their boundless enthusiasm to figure out what’s behind the latest neighbourhood conundrum. A CBC original series, ADDISON is produced by Six Eleven Media. The series is executive produced by Charles Bishop and produced by Katrina Walsh with Edward Kay serving as story editor.